Seems kind of strange that today is Easter Monday and also April Fool's Day. Sort of a mix of serious and silly it would seem to me. I decided to lean more toward the silly. I've written about Easter the past few years. In 2011, I wrote about the colors of Easter and my thoughts on the whole Spring Bunny thing http://pixiedusthealing.blogspot.ca/2011/04/easter-colors.html. I talked about the colors of Easter as they related to Chakras and considered it was a good time to tune in to your intuition and bring it into your personal power of renewal. In 2012, I was still on that Spring Bunny theme, but seems I was getting a little lighter myself. I did see this time of year and this particular holiday as a good time to consider the Bach Flowers Agrimony and Scleranthus http://pixiedusthealing.blogspot.ca/2012/04/easter-full-moon-in-libra.html We were in a Libra full moon cycle at Easter time last year too, so balanced emotions were really front and center. Those Bach Flowers still seem a good match for the energy of the day to me. But the whole world has changed this year I believe. We are in a new cycle. Maybe it's time to really lighten up a bit. Maybe it's no coincidence that this year, Easter Monday is falling exactly on April Fool's Day. I don't see any other way to take that but as a message to "lighten up" and get "over ourselves"! That kind of mystical quality led me to the idea of the Fool card in Tarot Decks. 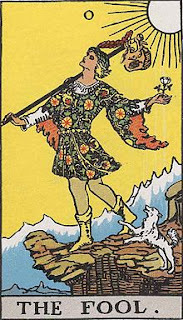 Today's picture if the Fool from The Rider Tarot Deck. I am, by no means an expert in Tarot cards. But, I do have the book "Tarot For Dummies". Yup, I'm not kidding, and I did warn you this post wasn't highly serious in nature! It turns out the Fool is considered to be "spirit in search of experience". It is considered mystical cleverness without reason, sort of "crazy wisdom". If you look at the card, it's obvious that this guy is about to walk off the edge of a cliff without any real concern. In fact, he seems oblivious to his impending plunge into the abyss. No worries there; ultimate trust and unconcern. The sun clearly shines on the Fools back though and that signifies divine nature. That seems to me to speak to real Crown Chakra, the knowing that you're protected, and "peaceful in the knowing" type attitude. He also has a dog with him that is said to represent animal desires. He's gently holding a flower which is interpreted as an appreciation of nature. So it seems to me he's got both a connection to the beyond, at the same time he's very in tune with earth and nature. A nice balance there in my opinion. The Fool is also carrying all his possessions with him in that Hobo style stick/backpack. He's ready for whatever adventure comes up. He doesn't have to go home and pack first. He has everything he needswith him all the time. Yet, his load looks pretty light and easy to transport. Sounds good to me! So... lighten your load, trust the divine, find that balance between nature and the unseen, and get your adventure started. Happy Crazy Wisdom Day, and enjoy the journey!! Enjoy the worry free adventure!